Our Fave Five essentially represents a listing of stocks with favorable short term total return forecasts (1 year, according to Analyst Consensus Estimates, or ACE) combined with strong long-term return forecasts and good/excellent quality rankings. The average 1-year ACE total return forecast is 8.2%. The Long & Short. (July 28, 2017) Projected Annual Return (PAR): Long term return forecast based on fundamental analysis and five year time horizon. Quality Ranking: Percentile ranking of composite that includes financial strength, earnings stability and relative growth & profitability. VL Low Total Return (VLLTR): Low total return forecast based on 3-5 year price targets via Value Line Investment Survey. Morningstar P/FV: Ratio of current price to fundamentally-based fair value via www.morningstar.com S&P P/FV: Current price-to-fair value ratio via Standard & Poor’s. 1-Year ACE Outlook: Total return forecast based on analyst consensus estimates for 1-year target price combined with current yield. The data is ranked (descending order) based on this criterion. 1-Year S&P Outlook: 1-year total return forecast based on S&P 1-year price target. 1-Yr GS: 1-year total return forecast based on most recent price target issued by Goldman Sachs. The relative/excess return for the Fave Five tracking portfolio is +0.6% since inception. 43.7% of selections have outperformed the Wilshire 5000 since original selection. The absolute annualized rate of return is 15.9%. Reprinted from April 1999 issue of Better Investing to celebrate a 35th wedding anniversary. Recall that this was before the market breaks after the turn of the century and the Great Recession of 2008-2009 when the “gaming” and irresponsibility reached unprecedented levels. It rekindled thoughts of a newsletter commentary that I had written for our investment club partners back in 1997. Our [35th] wedding anniversary. It seems natural that the long-term benefits of a relationship with my partner sent from heaven might kindle some thoughts of rewarding moments. In honor of our tenth anniversary, I “wifenapped” my spouse and whisked her away (without warning) to retrace our honeymoon voyage to Hawaii that we’d enjoyed ten years prior. Amidst tumultuous change, we actually found that some places had changed very little, a condition that is sometimes refreshing. We rented a car and headed for the “Seven Sacred Pools of Hana,” a challenging journey that assails the tourist with winding, undulating roads that can turn the most seasoned boater green. Since my wife had set the all-time record for seasickness on a cruise in 1982, I was amazed that she didn’t throw in the towel. With white knuckles, we pressed on. We continued our quest, gritting our teeth as the roads got narrower, bumpier, and the peaks and valleys came with increasing frequency. … a spectacular place where you can swim in crystal pools with the Pacific ocean surf roaring just a few feet away. Hana would rival Niagara for newlyweds, if it weren’t such a challenge to arrive. After a relaxing swim, we noticed a trail leading up the mountain that seemed to originate in the clouds. We took a deep breath and began our ascent. The trail traced the river and several charming waterfalls were visited as we made our way. We kept lifting our feet and trudging forward. Ninety-eight percent of the tourists began to turn back. We crossed the river on stepping stones and decided to venture further. The trail got steeper, the foliage and humidity got thicker, and it got hotter. We reached an “impenetrable” bamboo forest. It became stifling but we continued our foray. A thunderous roar began as a whisper and now approached deafening proportions. A few more steps and WOW! We were overwhelmed by an awesome vista… a gargantuan waterfall, and the arduous voyage meant that very few ever see this hidden splendor. I can still smell the bamboo and hear the roar. Investing, by definition, mandates a certain measure of patience and perspective. As I watch the frenzy of traders, I’m reminded of this generation’s heritage of Pong, Space Invaders, Pac Man, and our current Nintendo distractions. It seems to me that this generation is growing up on lightning reflexes and high speed transactions. It’s a small jump from Nintendo 64 to the characteristics of day trading and short-term frenetic behavior. Most of the people that you read and hear about belong in this camp. Patience, commitment, and a long-term perspective. Absence of change and steady focus on principles is extremely refreshing. The investment clubs and investors that we “hear from” are well on their way to living their own hidden waterfalls. Our Fave Five essentially represents a listing of stocks with favorable short term total return forecasts (1 year, according to Analyst Consensus Estimates, or ACE) combined with strong long-term return forecasts and good/excellent quality rankings. The average 1-year ACE total return forecast is 9.7%. The Long & Short. (July 14, 2017) Projected Annual Return (PAR): Long term return forecast based on fundamental analysis and five year time horizon. Quality Ranking: Percentile ranking of composite that includes financial strength, earnings stability and relative growth & profitability. VL Low Total Return (VLLTR): Low total return forecast based on 3-5 year price targets via Value Line Investment Survey. Morningstar P/FV: Ratio of current price to fundamentally-based fair value via www.morningstar.com S&P P/FV: Current price-to-fair value ratio via Standard & Poor’s. 1-Year ACE Outlook: Total return forecast based on analyst consensus estimates for 1-year target price combined with current yield. The data is ranked (descending order) based on this criterion. 1-Year S&P Outlook: 1-year total return forecast based on S&P 1-year price target. 1-Yr GS: 1-year total return forecast based on most recent price target issued by Goldman Sachs. The rate of return for the tracking portfolio is 15.6% since inception. The relative/excess return for the Fave Five tracking portfolio is +0.8% since inception. 46.2% of selections have outperformed the Wilshire 5000 since original selection. “It still holds true that man is most uniquely human when he turns obstacles into opportunities.” — Eric Hoffer (1902-83), U.S. philosopher. Reflections on the Human Condition. Portfolio design. Art or science? Or both? We build our portfolios with the expectation they’ll bridge to desired outcomes and financial independence. Perhaps visionary artist, scientist and Renaissance Man Leonardo da Vinci can inspire some insights on portfolio design? The term renaissance literally means “rebirth” and was first used in 1855 by French historian Jules Michelet. The Renaissance was a period of intellectual revival, roughly from the 14th through the 16th century, and marked the transition from medieval to modern times. This period is regarded as a time of intellectual ferment that laid the foundation for future progress. Some historians suggest the Renaissance was indeed the birth of modern humanity after a long period of decay. Modern scholars have since debunked the idea that the Middle Ages were dark and dormant. Parallels to Our Current Stock Market? The last two years have not been kind to investors. It’s a massive challenge to find solace in returns that haven’t receded as much as the market in general. Declines are still that — declines. In some ways, the decline of the last two years has been more severe than what was experienced in 1973-74. Experienced investors often describe their 1970’s experience as a sort of investing dark ages. The high inflation rates and recessionary conditions must have seemed interminable at the time. But [our community of] investors who have “been there” seem to focus on something completely different. During a recent presentation in Cleveland, a gentleman used our question-and-answer session to share how everything he did during the 1970s — a systematic implementation of buying good companies at good prices — was merely the launch pad for what happened in the 1980s and 1990s. Thomas O’Hara speaks of the period in the same tone of voice and same life experience. Some would have us believe we’re at the doorstep of another dark age. The last two years are their evidence. I believe the renaissance of American enterprise that ignited during the 1980s and caught fire during the 1990s is merely pausing to catch its breath. 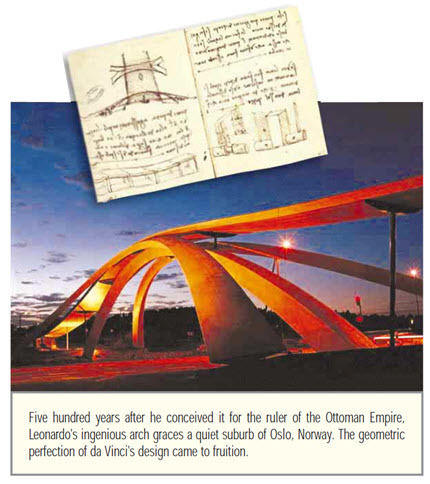 In 1502 da Vinci proposed building one of the largest bridges in the world for the ruler of the Ottoman Empire.The Sultan wished to span the Golden Horn, an inlet between the Turkish cities of Pera and today’s city of Istanbul. To the astonishment of the Ottoman court, the proposed design took the form of a giant arch. After conferring with advisers, the sultan responded with what seemed like commonsense — an arch that big would collapse in the middle. He declined the proposal. In his book, How to Think Like Leonardo da Vinci, Michael J. Gelb shares his perspective on seven principles drawn from a study of the man and his methods. The first principle is Curiosita — an insatiably curious approach to life and an unrelenting quest for continuous learning. The elements of portfolio design are the continuous selection (and accumulation) of quality companies and the continuous development of expected returns for the holdings that serve as our bridges. Be continuously curious. Our Fave Five essentially represents a listing of stocks with favorable short term total return forecasts (1 year, according to Analyst Consensus Estimates, or ACE) combined with strong long-term return forecasts and good/excellent quality rankings. The average 1-year ACE total return forecast is 9.8%. The Long & Short. (June 23, 2017) Projected Annual Return (PAR): Long term return forecast based on fundamental analysis and five year time horizon. Quality Ranking: Percentile ranking of composite that includes financial strength, earnings stability and relative growth & profitability. VL Low Total Return (VLLTR): Low total return forecast based on 3-5 year price targets via Value Line Investment Survey. Morningstar P/FV: Ratio of current price to fundamentally-based fair value via www.morningstar.com S&P P/FV: Current price-to-fair value ratio via Standard & Poor’s. 1-Year ACE Outlook: Total return forecast based on analyst consensus estimates for 1-year target price combined with current yield. The data is ranked (descending order) based on this criterion. 1-Year S&P Outlook: 1-year total return forecast based on S&P 1-year price target. 1-Yr GS: 1-year total return forecast based on most recent price target issued by Goldman Sachs. The relative/excess return for the Fave Five tracking portfolio is +0.2% since inception. 44.8% of selections have outperformed the Wilshire 5000 since original selection. The absolute annualized rate of return is 13.9%.